I love making birthday cakes. There's something really lovely about bringing a smile to a friend's face on their special day. It's beginning to be a bit of a tradition among my friends at university that I provide the cake as a present - yesterday I made my forth of this (academic) year. I've posted about birthday cakes before - such as with the trusty Double Chocolate Birthday Cake recipe for my Mum and when I made a Summer Fruit and White Chocolate Layer Cake for my mum's friend. 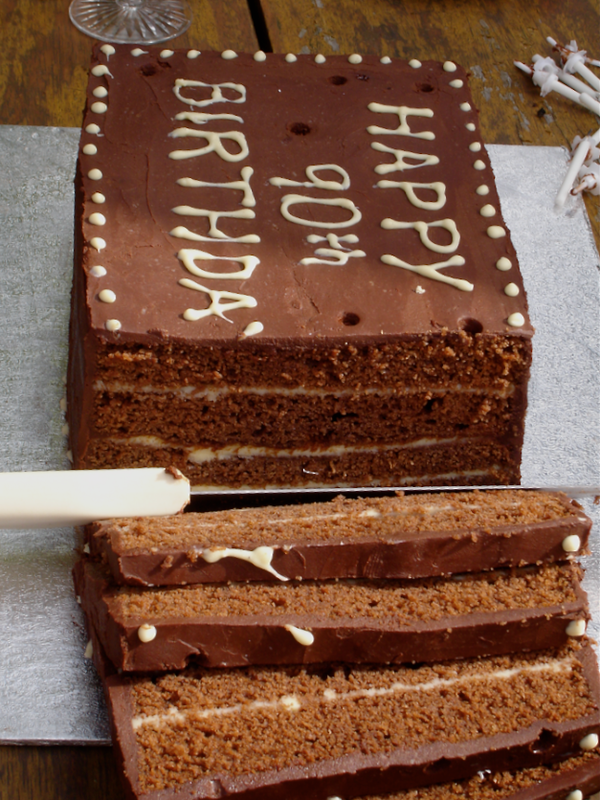 This summer I used the double chocolate recipe again to make my Grandfather's 90th birthday cake. I had to use rectangular roasting tins to make it as that was all I could find big enough in his kitchen - I hadn't brought my tins over from home. Still, it turned out well in the end - with some trimming! I try not to branch out too much with birthday cakes. 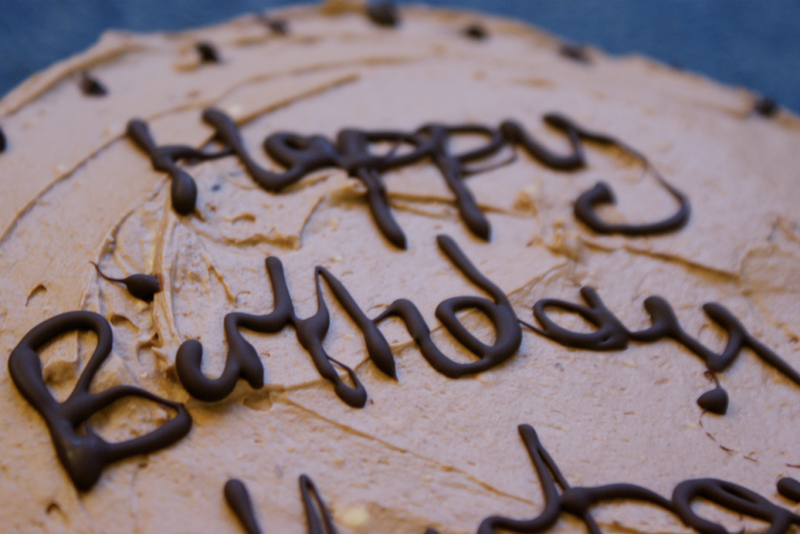 It would be so disappointing if the birthday boy/girl didn't like it - let alone anyone else excited for a slice. I try not to get too over enthusiastic about very dark chocolate ganaches and cutting sugar and steer towards something a bit sweeter and crowd-pleasing. For a similar reason, the past three have been vanilla sponge - especially as one of my lovely flat mates doesn't like chocolate cake for some unfathomable reason . However, I have experimented a little with icings and decoration. 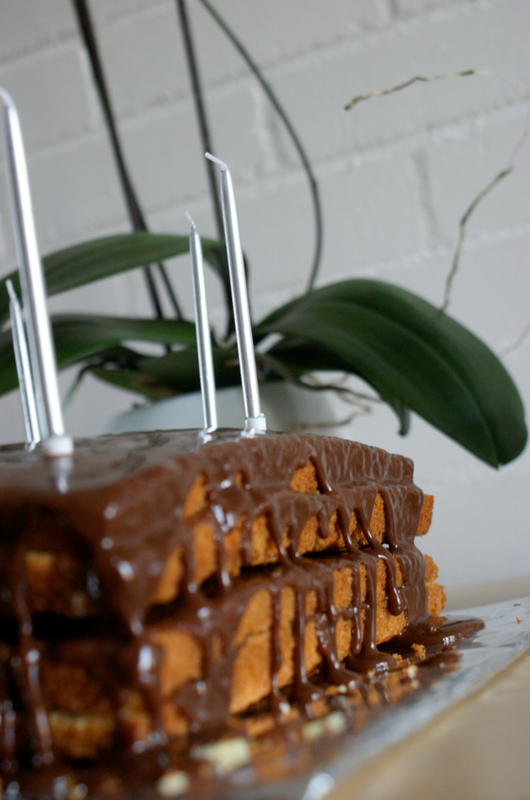 The first (above) was covered with a drippy milk chocolate ganache. Then I sandwiched the second (below)with fresh raspberries and raspberry jam and covered it with vanilla buttercream, decorated with marshmallows, Smarties and chocolate buttons. The third (no pictures, unfortunately) was a square cake cut into an 'M' shape and covered in a Snickers icing - I melted milk chocolate, a Snickers bar, a spoonful of peanut butter and some butter together then beat in double cream when it had cooled - which was seriously good! This time I decided I wanted to make a chocolate cake. Inevitably I reached for the family recipe, as above. I wanted to do something a little different with the icing. In September last year, my Mum and I went into London the day before a family funeral. Neither of us were very well and we were feeling quite miserable. 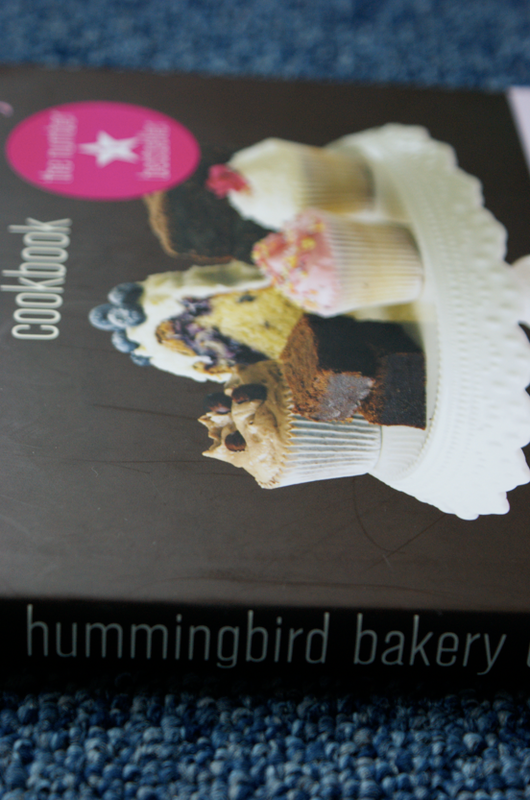 We were driving along in South Kensington when I noticed a bakery - and not just any bakery, but The Hummingbird Bakery. And so we stopped, found a parking space and went in. I had hot chocolate (very yummy and rich) and a red velvet cupcake (I had to try one, having never before) - Mum had a carrot cake cupcake. It was all lovely - though I have to admit, I did find them slightly too sweet after a few bites. Still, they brought a smile to our faces on that difficult day. We stayed for about an hour chatting to a mother and son who were sat at the next table about life and baking - and how good the bakery's cookbook was. I bought Mum a copy for christmas but I obviously couldn't separate her from it when I came here, so I was very pleased to hear my flat mate also was given a copy. It was to this book that I came back to when I was searching for a cream cheese icing like the one I had tasted. 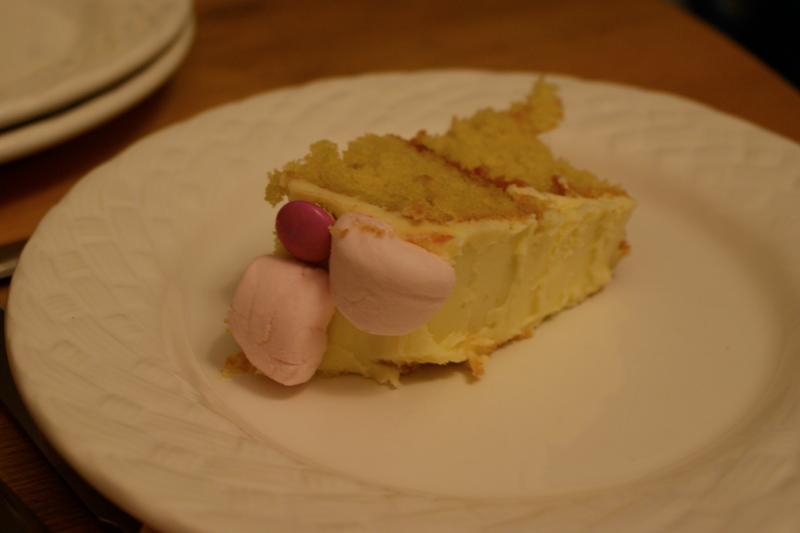 I doubled the recipe to cover the cake, cut a large amount of the icing sugar out and added a bit more cream cheese. 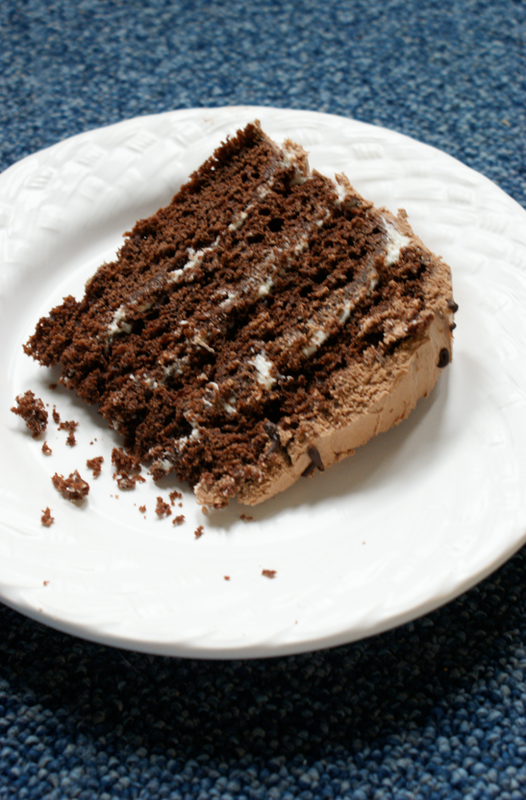 I used this plain icing to sandwich the four layers. Then I melted some dark chocolate and let it cool before folding it into the remaining icing. 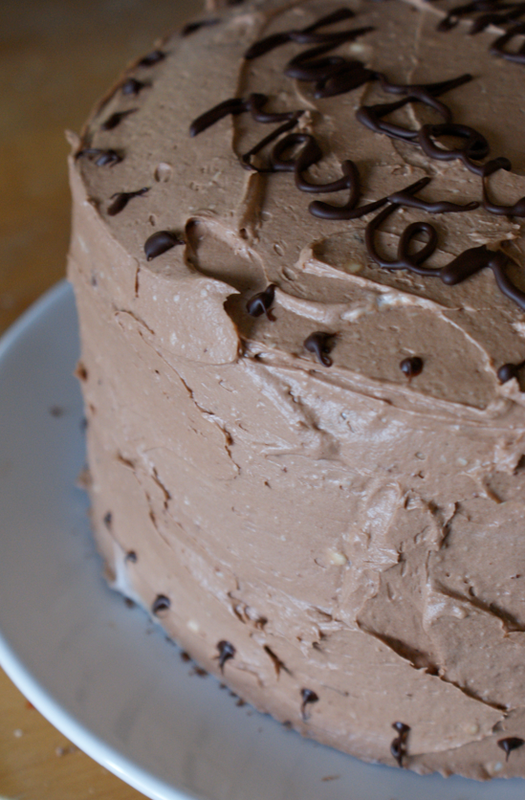 This I used to crumb-coat and then ice the cake - I had quite a bit leftover in the end. I used a little melted dark chocolate to decorate. It's iced with the 'Harbour Master' because the birthday boy created a Port Night (Monday Night is Port Night, don't you know) at college and is styled as the Harbour Master. Don't ask. Beat the butter until smooth, then add the icing sugar and beat on a very low setting (or you'll suddenly find yourself in a cloud of sugar!) until it is evenly dispersed. It didn't come together - just turned it a pale yellow. Tip in the cream cheese and salt and mix in at a low speed until it comes together, then turn the speed up and beat until light and fluffyish. To make the remainder chocolate flavoured (to turn the whole mix, use maybe 75-100g depending on how much of a chocolate flavour you want) melt the chocolate in a double boiler or in the microwave. Allow to cool till it's room temperature but still liquid, then pour into the icing and fold in evenly. that is super pretty and looks so tasty !!! In my search for freezable icing for cupcakes, I accidentally discovered a similar one to yours and it used peanut butter with the melted chocolate. My sons are allergic to all nuts so I just omitted the peanut butter and it tasted almost like a caramel frosting using milk chocolate. I daresay that a few salt flakes can give it a different dimension. Its more chocolatey with dark chocolate.